Tender chunks of grouper lightly fried, served with lemon and tartar. Tender rings and tentacles hand-breaded and lightly fried. Served with our homemade marinara sauce. Six coconut crusted shrimp lightly fried and served with an orange marmalade dipping sauce. 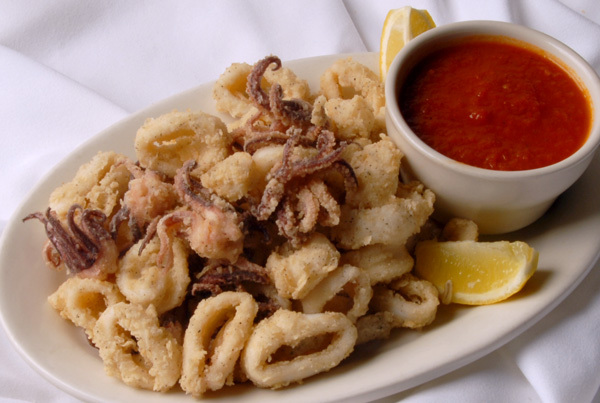 Steamed and served in our marinara or scampi sauce. Served with garlic toast. Please choose type of sauce. One-half dozen raw oysters served with lemon and cocktail sauce. Six mushrooms caps filled with our specialty crab meat stuffing and smothered with mozzarella cheese. Six out of the shell snails sautéed in our homemade garlic butter and served with garlic toast. Sharp Kefalograviera cheese sautéed in butter, served on a hot skillet, and drizzled with lemon juice. Six mozzarella sticks deep fried to golden brown. Served with homemade marinara sauce. Fresh Gulf jumbo shrimp steamed in our own special spices, and served chilled with crackers and cocktail sauce or steamed with drawn butter. Generous portion of beer-battered onion rings, served with a spicy horseradish dipping sauce. Peeled and de veined, six jumbo shrimp served with lemon and cocktail sauce. Four tender strips of chicken fried to golden brown and served with honey-mustard. One dozen served dipped in our spicy buffalo sauce. Served with celery sticks and blue cheese. 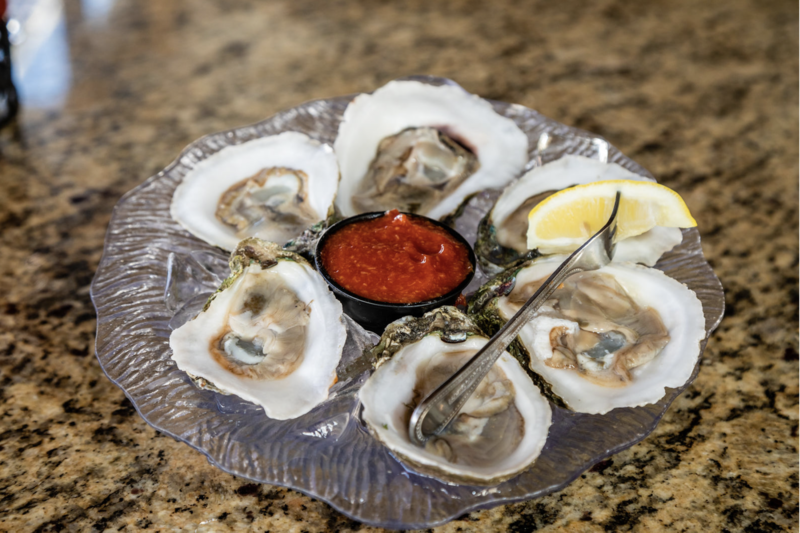 Six oysters stuffed with our spinach, Feta cheese, and bacon stuffing. Served with garlic butter. 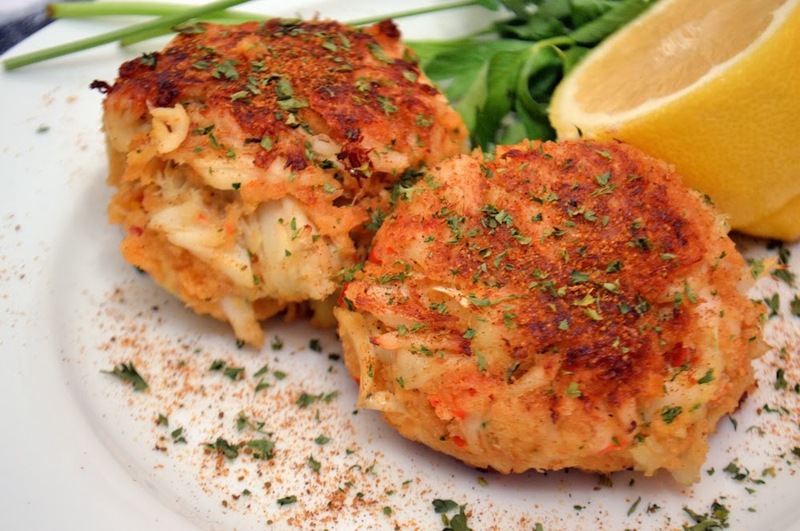 Two Maryland style crab cakes served with a red pepper remoulade sauce. One pound steamed and served with drawn butter. Our famous fish & chips area a local favorite. 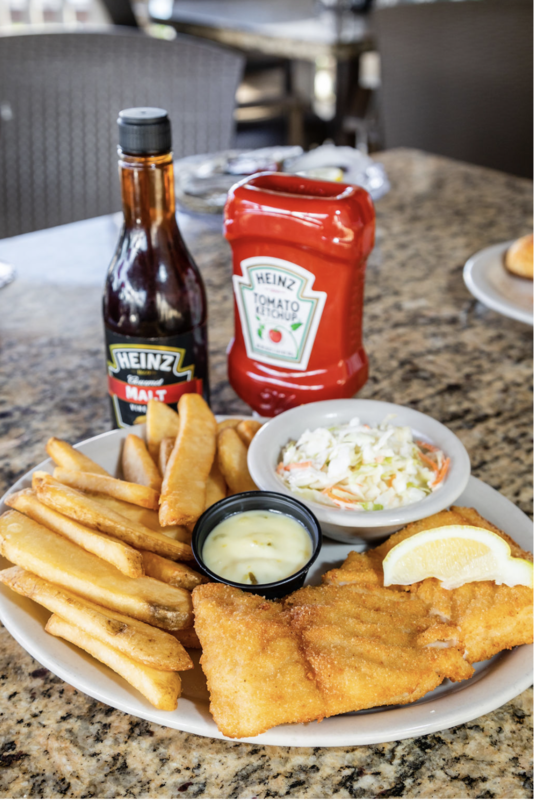 Each order is hand-breaded and served with coleslaw and steak fries. Guaranteed to keep you coming back. 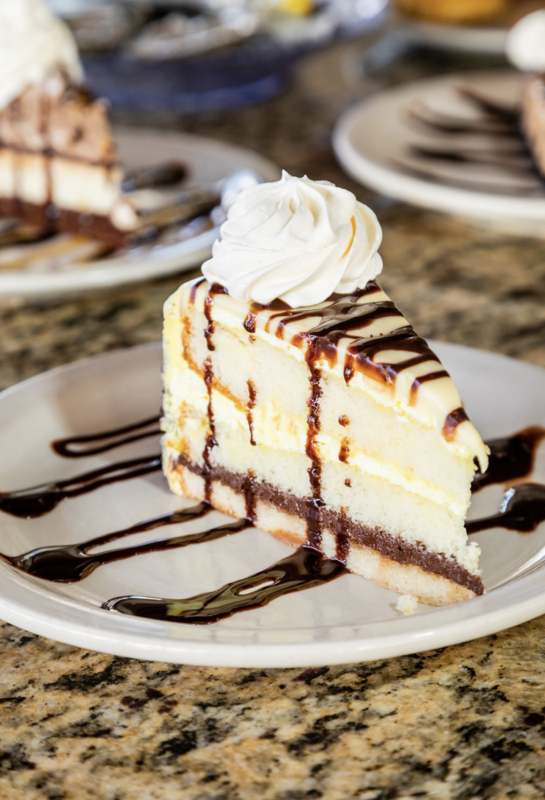 One taste and you'll be hooked! Fresh mild Florida white fish served broiled or fried. Add one of our specialty sauces to your broiled fish. Fresh broiled grouper stuffed with our homemade crab meat stuffing. Fresh grouper filled with our homemade spinach, Feta cheese, and bacon stuffing. Fresh filet of flounder served either broiled or fried. Broiled flounder stuffed with crab meat stuffing. Fresh Atlantic salmon filet seasoned and broiled to perfection. Eight jumbo Gulf shrimp hand-breaded and fried to golden brown. Six large Gulf shrimp stuffed with our homemade crab meat stuffing. sauce; served over yellow rice. Six large Gulf jumbo shrimp topped with our homemade marinara sauce and melted mozzarella cheese. Large sea scallops served broiled in our scampi butter or hand-breaded and fried to golden brown. 2.125 lb. Maine lobster served steamed or broiled with our crabmeat stuffing. How would you like your lobster cooked? Lean 10oz. grilled center cut. Our most tender cut of beef. Lightly seasoned 14 oz. aged strip steak, grilled to your liking. 12 oz. well marbled, juicy Ribeye. A true steak lover's steak. Lean, center cut 8 oz. sirloin grilled to perfection. Two 8 oz. loin center cut pork chops, seasoned, grilled and served with applesauce. Tender breast of chicken lightly breaded and topped with homemade marinara and mozzarella cheese. Spinach, Feta cheese, and bacon bits smothered over grilled chicken breast topped with melted mozzarella cheese. Tender frog legs served either fried or broiled in our homemade garlic butter. Broiled shrimp, sea scallops, grouper, and flounder lightly dusted with our homemade breadcrumbs seasoning. Broiled rock lobster tail, sea scallops, snow crab legs, and fried shrimp. Fried combination of shrimp, scallops, and grouper. Two 7 oz. rock lobster tails dusted with our special bread crumb mix and broiled. Served with drawn butter. Broiled shrimp, scallops, & crab meat stuffing. Rock lobster tail seasoned with our house bread crumb mix & broiled; accompanied with five jumbo Gulf shrimp. 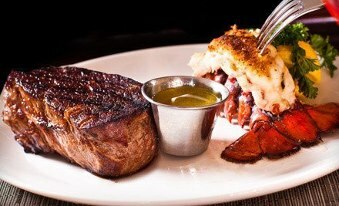 The best from the land and sea; filet mignon and a broiled rock lobster tail. Sautéed shrimp in a white wine garlic butter sauce served over a bed of linguini. 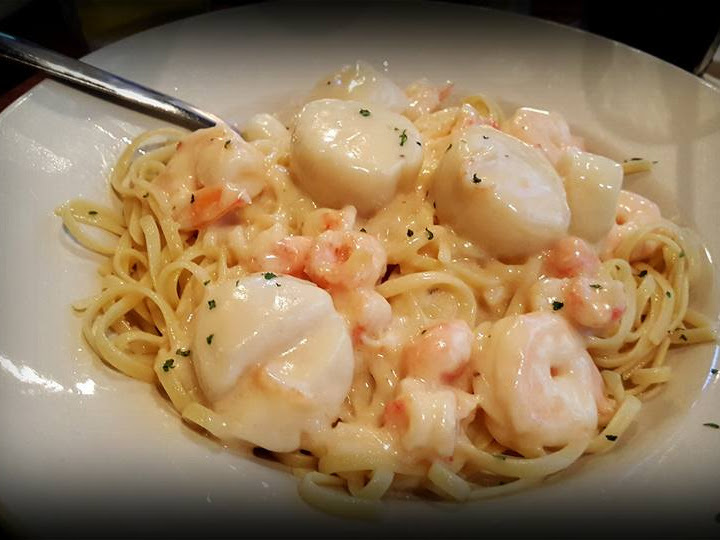 Large sea scallops sautéed in our homemade scampi sauce served over a bed of linguini. Tender strips of chicken breast sautéed in a white wine garlic butter served over linguini. Tender shrimp, sea scallops, and lobster meat tossed in a creamy parmesan alfredo sauce on a bed of linguini. Grilled chicken breast seasoned with our own Cajun spices served over linguini, in a rich alfredo sauce. A fresh medley of vegetables over linguini sautéed in a white wine garlic butter sauce. Four large pasta shells stuffed with ricotta cheese, topped with marinara sauce and mozzarella cheese. Steamed Canadian mussels served over linguini with your choice of scampi or marinara sauce. 7 oz. rock lobster tail broiled to perfection. 1/2 pound of sweet & tender crab legs. Six broiled in garlic butter. Garlic toast served with a side of our homemade scampi sauce for dipping. Try a taste of the old country! Fresh greens, tomatoes, cucumbers, onions, Feta cheese, Kalamata olives, and Greek peppers, topped with our homemade house dressing. Anchovies available upon request. Grilled chucks of fresh Atlantic Salmon over fresh greens, red onion, crumbled Feta cheese, drizzled with a balsamic glaze. Fresh greens, vine ripe tomatoes, cucumbers, onions, and croutons topped with your choice of grilled, buffalo, or cocktail shrimp. How would you like your shrimp cooked? What dressing would you like? How would you like your chicken cooked? Homemade tuna salad served over fresh greens, tomato, cucumbers, onions, croutons, Monterey Jack and Cheddar cheese. Homemade soup of the day complimented with one of our fresh garden salads. Fresh greens, tomato, cucumber, onion, Monterey Jack & Cheddar cheeses, with your choice of dressing. Flaky filet of fish hand-breaded, fried to golden brown served open-faced with coleslaw and pickle. Fried grouper, sweet slaw mix, and melted Swiss cheese served on toasted marble Rye. Served with steak fries. Maryland Style lump crab cake on a kaiser roll with lettuce, tomato, and red pepper remoulade sauce with cole slaw and steak fries. Crunchy fried shrimp, lettuce, tomato, cocktail & tartar sauces, on soft Cuban bread served with steak fries and coleslaw. 7 oz. choice Ribeye steak grilled and served open-faced with on toasted garlic bread with steak fries and au jus. Lettuce, tomato, pickle, coleslaw, and steak fries. Maple bacon, smoked cheddar, BBQ sauce, lettuce, tomato, pickle, red onion. Served with steak fries and coleslaw. Served on a toasted kaiser roll with our own special sauce, melted mozzarella cheese, lettuce, tomato, pickle, onion, coleslaw, and steak fries. Fried chicken breast topped with mozzarella and mariana on toasted garlic bread. Served with steak fries. Boneless breast of chicken, grilled and topped with lettuce, tomato, pickle, and honey-mustard on a toasted kaiser roll. Served with coleslaw and steak fries. Boneless chicken breast fried and tosssed in our spicy buffalo sauce with lettuce, tomato, pickle, and blue cheese on a toasted kaiser roll with coleslaw and steak fries. Chicken breast grilled with Cajun spices, served on a toasted kaiser, topped with mozzarella cheese, lettuce, tomato, & pickle. Served with coleslaw and steak fries. 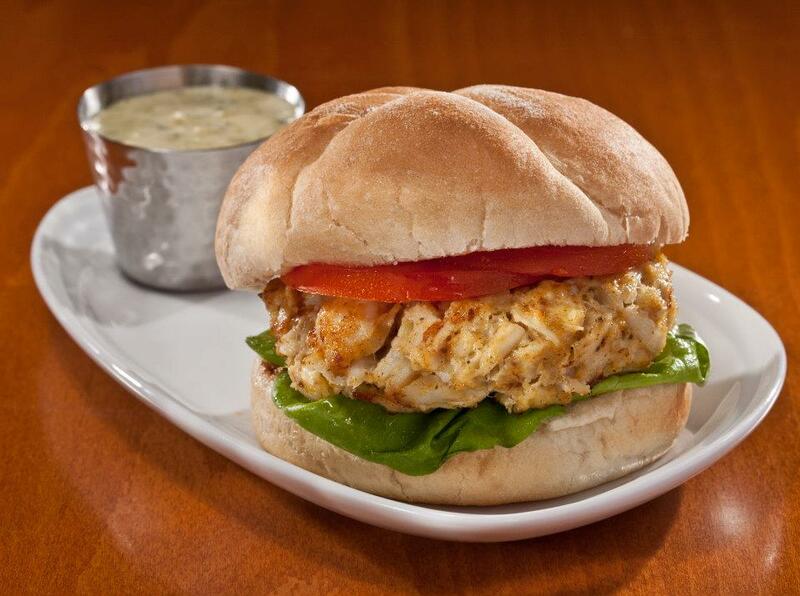 Fresh white albacore tuna salad served on your choice bread with lettuce, tomato, pickle, coleslaw, and steak fries. What type of bread would you like? Served with coleslaw and steak fries. Six coconut dusted fried shrimp served with cole slaw and steak fries. Served with an orange marmalade dipping sauce. Fresh mild Florida white fish served either broiled or fried. Six Gulf shrimp breaded with coconut and fried. Served with an orange marmalade dipping sauce. Half pound of steamed Alaskan crab legs served with lemon and drawn butter. Tender shrimp, sea scallops, and lobster meat tossed in a creamy parmesan alfredo sauce over linguini. Five sautéed shrimp in a white wine garlic butter sauce over linguini. Grilled chicken breast with our Cajun spices, served over linguini, in a rich alfredo sauce. Lean, center cut 8 oz. sirloin. Grilled to perfection. One 8 oz. loin center cut pork chop, seasoned, grilled, and served with applesauce. 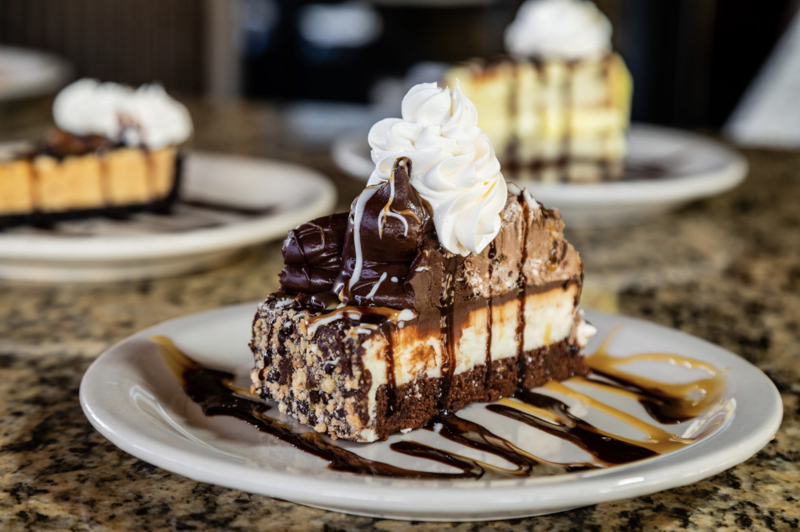 Chocolate brownie, New York Style cheesecake, chocolate ganache, chocolate truffle cake, chocolate mousse, and a chocolate praline crust make this five layer chocolate cake a rich death by chocolate dessert. 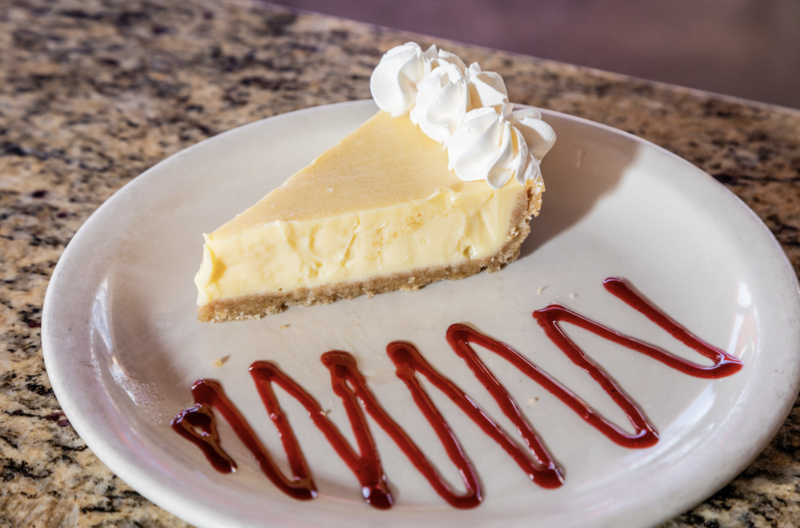 Fresh homemade key lime pie drizzled with raspberry sauce and topped with whipped cream. 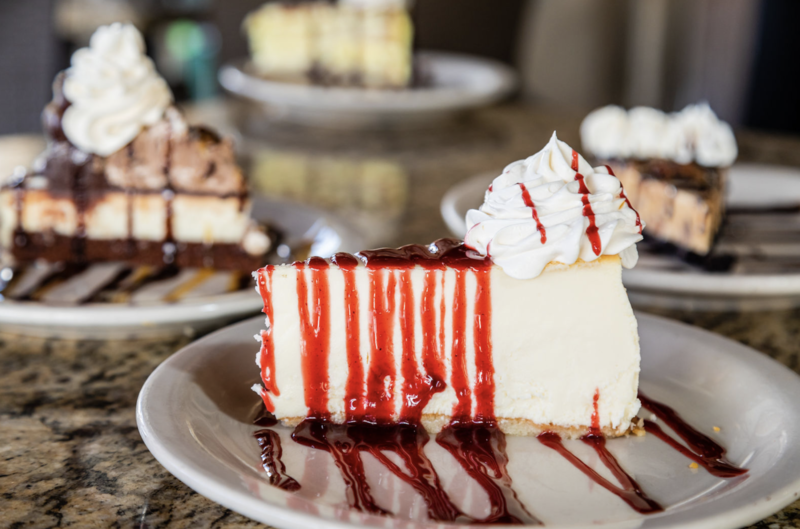 A rich New York Style cheesecake topped with choice of raspberry, chocolate, or caramel sauce. 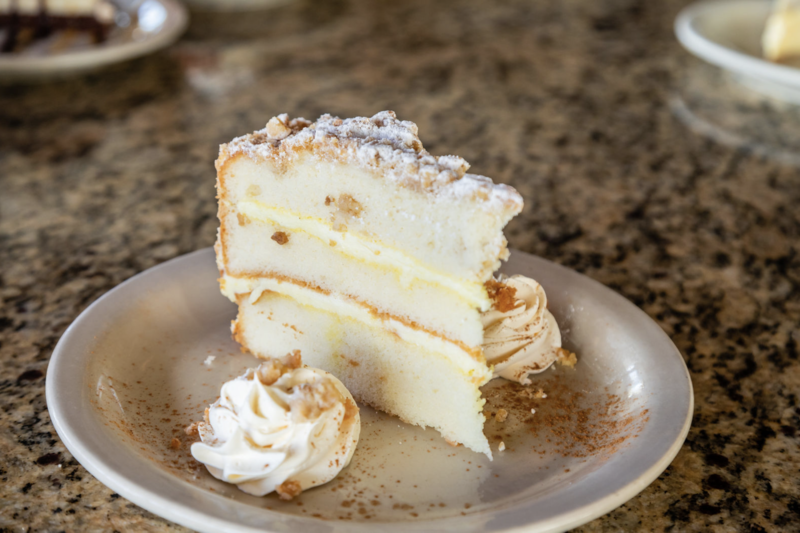 Three layer Lemoncello infused pound cake filled with Chantilly cream and topped with toasted streusal crumbs and powdered sugar. Three layers of moist banana cake soaked in banana syrup and filled with a layer of banana and chocolate buttercream, dipped in white banana ganache and drizzled with chocolate ganache and chocolate cake crumbs and chocolate chips. 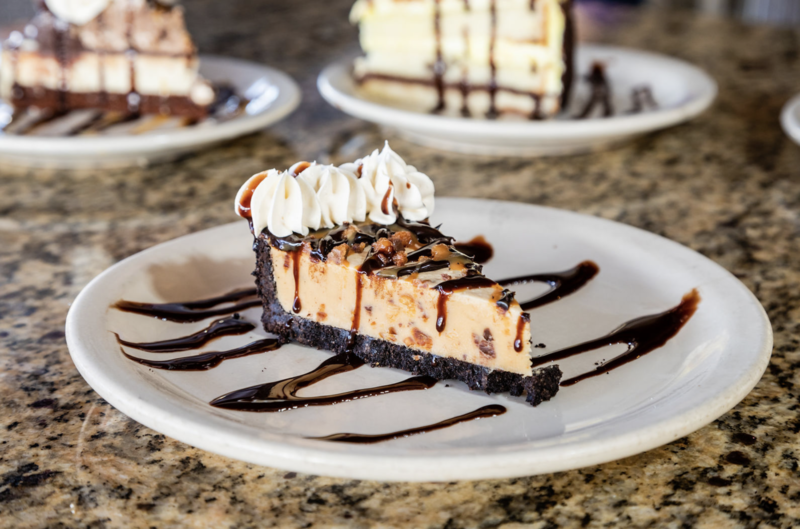 A chocolate buttery crust filled with chocolate ganache, peanut butter chips and topped with peanut butter mousse. Traditional double-scoop of vanilla, chocolate, or our flavor of the month ice cream with choice of chocolate, raspberry, or caramel sauce. Topped with whip cream and a maraschino cherry. Medley of broccoli, carrots, and cauliflower. Kids meals served with steak fries. Only for children under 10 years of age. Choose type of soft drink. Cardholder Verification and Identification: ALL GUESTS THAT PREPAY MUST HAVE PHOTO ID ALONG WITH CREDIT CARD USED UPON PICK UP. Consuming raw or uncooked meats, poultry, seafood, shellfish, and eggs may increase your risk of foodborne illness.